Nail head details always add a certain flair that just works - whether in an art deco, global bazaar or traditional space. 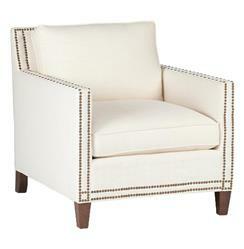 This classic arm chair is available in light ivory linen or your own material of choice, making the possibilities virtually endless. Your perfect armchair has now arrived! Custom made proudly in America, please allow 8-10 weeks for production.